From atop a smoldering, Afro-rock soapbox, rooted in the traditions of his homeland, an African immigrant and activist belts out this rallying cry, warning against state corruption and capitalistic greed. “People are trapped between governments and corporations,” says the Togolese-born Massama Dogo – singer, guitarist, composer, and founder of the band Elikeh. “Africans,” in particular, he continues, “are being used and abused” by these institutions. Exploiting a musical pulpit adorned with gritty guitar-heavy grooves, Dogo’s poignant diatribes achieve full resonance on Adje! Adje!, the new release from his D.C.-based ensemble. Dogo and his group seek to put the tiny sliver nation of Togo on the musical map. Even within Togo itself, this nation’s music has been marginalized by its own state-sponsored media. Remarking on his childhood growing up in this West African country, Dogo recalls, “the radio never promoted anything from Togo. They only played music from other countries.” Although it is improving, even today, Elikeh faces a tough Togolese media that are primarily oriented towards Ghanaian hip-life, Congolese Soukous, and Ivorian Zouglou music. Read more about Dogo’s past as an upcoming musician here. Illustrating the distinct sonic beauty of this creolized African dialect, Dogo relates the hardships of his adjustment to American life on the song “Madjo.” Creating an entrancing mixture of linguistic buoyancy, over the intimate rhythmic strumming of a loan crystalline acoustic guitar, Dogo trades versus with guest Malian rap artist Yeli Fezzo, who sings in Parisian French. Departing form the trends, Elikeh carves out their own musical space. “Everybody is going for straight up Fela Kuti Afro-beat style right now,” Dogo claims. “We have some of that influence; we have some highlife in there, but the way we incorporate rock is not there in other bands. As a joke we call it Afro-high; but we cannot call it that because everyone would think we are high all the time.” Reminiscent of the raw and rough Afro-rock sound coming out of West Africa in the 1970s, the songs “Oleblemi,” and “Get Ready” feature hard-hitting funk-rock grooves with mildly distorted guitar solos from veteran John Lee, who has played with a number of noted African musicians, including Baye Kouyate. The band’s sound is also distinguished by the trifecta of gravely guitars that weave throughout the album, creating dense multi-layered polyrhythmic patterns. These textures shimmer on “Let’s March,” a slow-burning re-invention of a composition by Nigerian songwriter Orlando Julius Ekemode. “The original uses keyboards,” Dogo explains, “but I think that a lot of African bands overuse keyboards.” Providing a direct connection to the roots of this song, the rhythmical guitar of Frank Martins—who also appeared on Ekemode’s original recording of this song—reverberates on this African anthem. Martins is also featured on “Aiko,” which uses a slowed-down version of a style from the Southern part of Togo called tumewe, combined with the call and response of the agbekor style. Building on the precedent of musical political activism set by artists such as Nigeria’s Fela Kuti and Zimbabwe’s Thomas Mapfumo, a majority of the ensemble’s songs have profound political themes. Opening the record with a haunting a capella chant, the album’s namesake, “Adje! Adje!” offers a warning. “We are saying: watch out! Here they come again – the multinationals and the corrupt governments,” says Dogo. “But this time we won’t let them take over our place!” This poignantpolitical message is punctuated with tight horn stabs, interlacing guitar lines, and dense polyrhythmical drumming provided by Tosin Aribisala, who is no stranger to socially conscious music. Arisbisala has toured with Femi Kuti, in addition to recording a tribute to Fela Kuti (Red Hot & Riot), which included such notables as Macy Gray, Erykah Badu, Sade, Baaba Maal, and Taj Mahal. 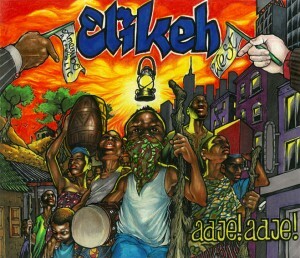 With their distinct brand of Togolese-infused “Afro-high,” which merges a re-invention of the rugged Afro-rock of the 1970s with Afro-beat, highlife, and roots music of West Africa, Elikeh prove that the marginalized music of a tiny overshadowed nation can inspire engaging new sonic landscapes, and stand shoulder to shoulder with its more notorious neighbors.